I have a problem; I often have a hard time connecting our vision and overarching goals to the items that we are actually working on. I want to be able to pick up anything we do and understand why we are doing this now and how it will take us closer to our goal. I’ve blogged about this before and in my time in Indonesia I even thought I had a great way of uncovering what those high-flying goals really means, by simply asking this question: What can we measure to see progress to that goal? But it turns out, understandably once I think about it, that question is too hard. The gap between the vision and the work is quite simply too big. To me often the connection between vision and our work reminds me a lot of the business of the underpants gnomes in South Park: It’s like Vision: “we’re gonna rock the world”, …, …, sticky on my board: “Make the button blue”. I don’t like it. There’s no connection. Or worse we try to make up the vision/goal, the why, from the work that we do. But I have an idea. We are trying it now at my current client. I wanted to share it with you. I have a problem; I often have a hard time connecting our vision and overarching goals to the items that we are actually working on. I want to be able to pick up anything we do and understand why we are doing this now and how it will take us closer to our goal. What can we measure to see progress to that goal? But it turns out, understandably once I think about it, that question is too hard. The gap between the vision and the work is quite simply too big. sticky on my board: “Make the button blue”. I don’t like it. There’s no connection. Or worse we try to make up the vision/goal, the why, from the work that we do. But I have an idea. We are trying it now at my current client. I wanted to share it with you. I have a few headings that outlines my thought and a suggested process. As always when I read this I need to remind myself that this work is not done in one single meeting or session. Let it grow on you. Under each heading I will write a little “How we did it” that describes the work we did at my current client. This is done to bring come concreteness and clarity to my rambling. I hope it helps you. First things first; a vision to me is a description of a future state. Where we would end up if we did our mission perfectly, if you will. It’s goal-oriented and where we want to aim. Well… under this heading this we were “lucky” in that the vision was already stated when we started our work. We were indeed lucky as it was a really good vision fulfilling many of the attributes I often lack. We will be best in Sweden in [our e-business] during 2017. Short, to the point and with a time frame. I love it! A steep order indeed. There’s of course up for discussion what “best” means but there’s other documents describing that part, and I don’t want to relate them here. You get the picture. You’ll have to talk about it. That’s also powerful. Talking I mean. 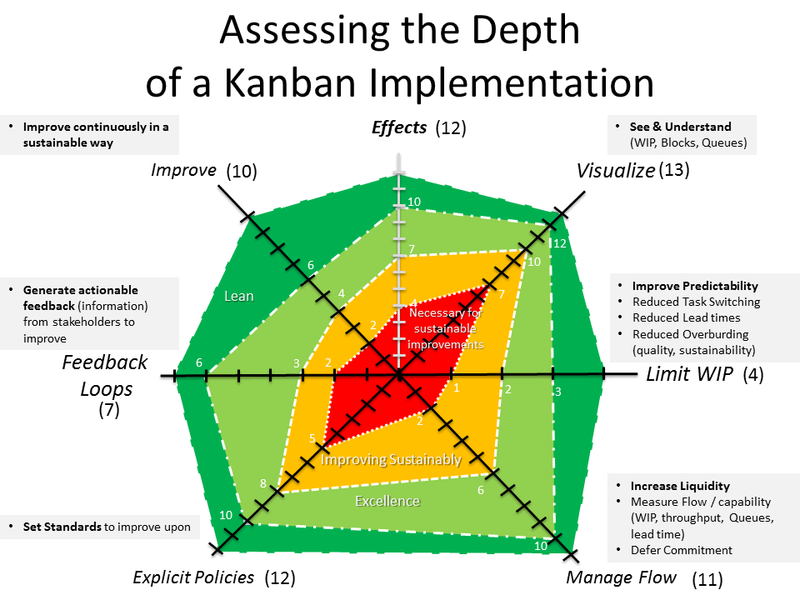 One of the foundational principles of kanban in particular and lean in general is to make work visual. It turns out that things that you can see are much easier to grasp and reason about. Never has this been more true than when you talk about abstract and highflying things like vision or goals for example. Take the abstract text and make it accessible, present and in-your-face-clear and much of the battle is won. Take a look at the pirate code of visualistation that we created a Rumah Sakit Bungsu a few years back - they work as a great start for me. I’m blessed right now with being surrounded by brilliant people. One of the new acquaintances I’ve made is Fredrik, a management consultant that brought some new ideas to us. Fredrik guided the management team (4-5 ppl) of our entire team (40-50 ppl) in a workshop where we defined the capabilities that we thought that we needed to reach the vision defined above. This turned out to be a brilliant idea for us, but for other goals maybe areas we need to change, or components or some other division altogether might be a good idea. We decided to plot all of the capabilities we thought that we needed in a so called “spider diagram” or more formally a radar chart. The area should be balanced and maximised most likely. This is easy to see and convey. Where we are now - the current area, for example the red area above. It’s also easy to see the difference or delta between where we are now and our desired state. Visualisation - can’t beat the feeling. We ended up with 7 different capabilities plotted out on a whiteboard, but you might have fewer or more. Examples of our capabilities were “Innovation within the team”, “Motivated team members” and “Short lead times” that we will use as examples throughout the post. Another great tip from Switch is to “send a postcard from the future”. Or in other words; tell the story about how it will be when we reach our goal. Now that we have a number areas that we needed to address, but how on earth can you get a shared understanding on what the grading of the axis mean? What does 4 on the “lead time” axis mean? This is not easy to answer but we did it by first defining awesome or what 10 looks like. Just before we continue, note that all axis might not be graded the same way. See the example chart above, one of the axis have 4 grades another 12. The area will be plotted using each axis individual score, so the grading doesn’t affect that much. If you have an easy way to measure the progress within one area use the grading that make sense. In our case we did not have a great way of grading our capabilities so we decided to use 10-grade scale for each. We then defined what 10 means for each axis. This was really fun and rewarding since we now could dream. Note that it doesn’t have to be achievable, since the reaching the vision means that the area needs to be balanced. Reaching the vision doesn’t mean that it’s maximised. “Motivated team members” - we are known for our good climate and people spontaneous comes to us to ask for job, because they’ve heard about us. Go crazy and dream big! What would awesome look like? A little bit harder and often a little bit sadder might be to try to figure out where we are now. Because sometimes the might be a long way from awesome. However, there’s no use trying to sugar coat it. Just tell it as it is. I often tell my clients I don’t care where we are now - I just want to be better tomorrow than we were today. I think we too often try to soften then blow by painting a picture of something that is just not true. That might feel better now but there will be problems coming around the corner, when we will have to explain why we haven’t delivered on our promises. I’ve never got in problems by being honest. I have got into problems by trying to soften the blow. Your milage may not vary. For this exercise we had an extensive discussion (creating “the spider” and defining what 10 means was pretty fast) for each item. We discussed open, transparent and honest about our challenges in each “leg” of the spider until we came to a reasonable number. In our case the total area was pretty small indeed, with none of our 7 legs reaching beyond the number 3 grade. But hey - at least now we knew that. We also listed a few bullets on a post-it, explaining our reasoning behind each grading. At this point you probably, like us, have a radar chart that shows you biggest gaps between now and your desired end-state and your current grade. Probably you’ll see one or two things where the difference is bigger. Those might be good starting points. Or you might know that another leg is an easy fix - that’s also a great starting point, since the feeling of progress and improvement trigger a good flow. In our case we realised pretty soon that some activities we had in mind would actually improve other things. If we improved our lead time we will get better motivation in the team, and most likely more innovation would take place too, for example. Here we made an over simplification - we started to list activities right off. And for a long time nothing got done. Again the gap between “best in Sweden during 2017”, “let’s improve lead times” and “implement continuous integration server” felt too far. a strategic planning technique that prevents organisations from getting lost while building products and delivering projects, by clearly communicating assumptions, helping teams align their activities with overall business objectives and make better roadmap decisions. Goal or Why - the legs in the radar chart now becomes impact maps, where the impact you want to make in the coming 3-6 moths is the goal or why of the the impact map. Note that we give a concrete and measurable number for our goal - how would we know if we have improved otherwise. Actor or Who - who do we need impact to reach this goal? Impact or How - how do we need to impact them? 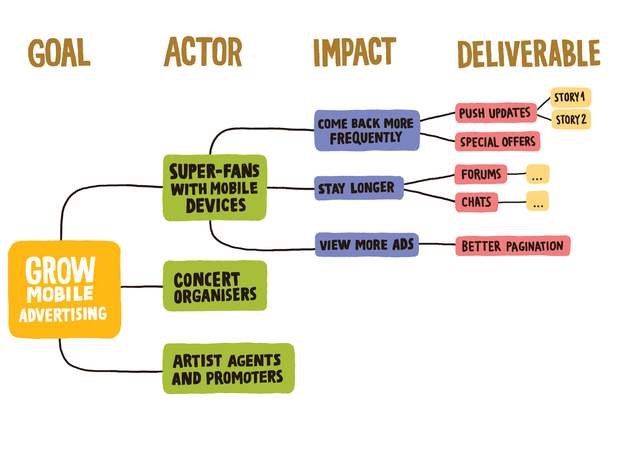 Deliverable or What - what do we need to do, in order to impact the actors in the way we want. Note that we might try several different things here, maybe even at the same time. Who knows what will be the one that make the impact? Let’s keep our options open. The scope of a typical impact map is 3-6 months, after that we create new map. This is again perfect for our needs in the context this post is about. Longer than that and the diagram will be uninteresting. Also, just pick one or two areas for effectiveness. There’s no use doing them all at the same time. Limit work in process is very much in process here too. This decision might also effect the scope of your impact map. Let’s run for 2 months with one of the “legs” and then reevaluate. This is where we are now, but basically we picked one of the legs with greatest “potential” and for it we have a short workshop where we create an impact map. Most likely we will just try to improve the one leg from our current state and then a few clicks forward. No reason try to shoot for 10 if it’s far away. Remember that many things are related so affecting one capability probably pulls others with it. The beauty of this is that the Deliverables now actually are the stickies on our board. Now I can pick up a sticky on our board, I can see Why we are doing this now and how it connects not only to the immediate goal but also how it contributes to the overall vision and goal for our organisation.